Today, March 12, is the world day against cyber-censorship. This day was initially launched by Reporters without Borders in 2008 and "is intended to rally everyone in support of a single Internet without restrictions and accessible to all." The fight for online freedom of expression is more essential than ever. By creating new spaces for exchanging ideas and information, the Internet is a force for freedom. 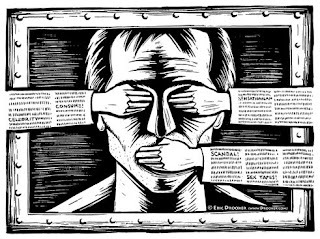 In countries where the traditional media are controlled by the government, the only independent news and information are to be found on the Internet, which has become a forum for discussion and a refuge for those who want to express their views freely. However, more and more governments have realised this and are reacting by trying to control the Internet. Never have so many countries been affected by some form of online censorship, whether arrests or harassment of netizens, online surveillance, website blocking or the adoption of repressive Internet laws. Netizens are being targeted by government reprisals. Around 117 of them are currently detained for expressing their views freely online, mainly in China, Iran and Vietnam. Bahrani Blogger Arrested for Spreading "False News"
Why am I posting all this? Well because after all these incidents (and many others), I want the world to realize how freedom of expression is important and how even the most advanced and democratic countries in the world (US and Europe included) contribute to cyber-censorship. I want to raise awareness about the limitations that we still have in this world at a time when mankind has achieved so many technological and evolutionary advances. We are in the 21st century! You would think that people would at least have the freedom to say what the want. I guess there's still a looooooong way to go!